As usual, wake up early morning, sit on my bed for few minutes, go and pee, come back to my room and open my laptop, check my facebook, mails and see what's Ozsale is selling today. I open up my gmail, click on inbox and saw this! OMG! Are they selling Burberry??? You kidding me right?? I'm waiting for this moment for so long and finally come!!! It's Burberry, come on! 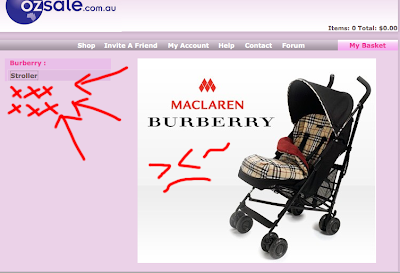 But, Burberry Maclaren, is that new one? like Burberry Blue?? Is that for men? Oh what the dut, I wanna see what they have!!! Dresses?? Accessories?? Bags?? I was so excited til I open the Ozsale website and see this. Err..... Stroller?? Burberry STROLLER?!!? NO DUT-ING WAY! But I look at it again, oh? Burberry stroller ey....? A luxury strolley for baby to drool on. Nice! Anybody wants it? Any babies love Burberry like I do? hehehe.. it's only AUD444! Good deal! Original price is AUD1200.